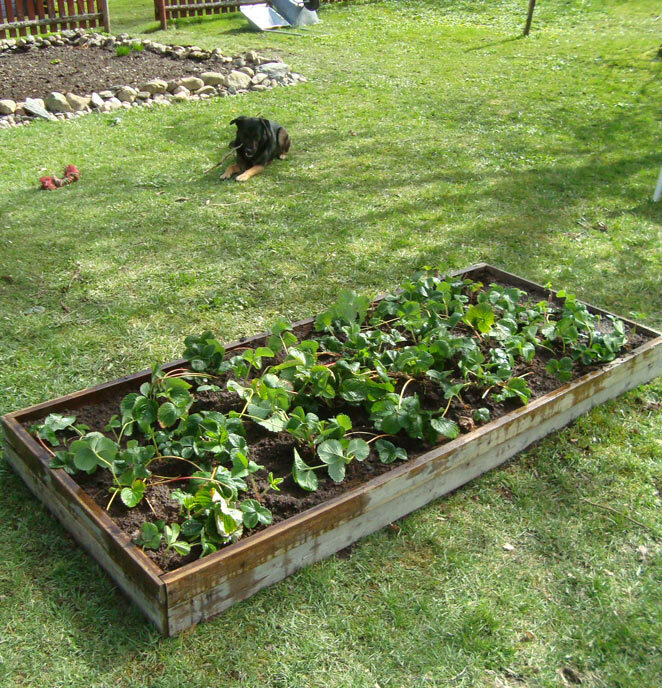 We needed a new bed for our 12 strawberry plants and their daughter plants. We went to our local (Återbruk station) Re-purpose station on Friday. It is only open one day a week at this time of year.We had to track down the woman who works there. unfortunately we interrupted her lunch break. She was really nice to walk up and meet us. We originally had our eye on wooden containers they were using to store their wares. She informed us they didn’t have enough for our own use. We told her we have another option that we saw in the back. We found and old antique door jam with no door in a pile. The older door jams are wider then the newer ones. 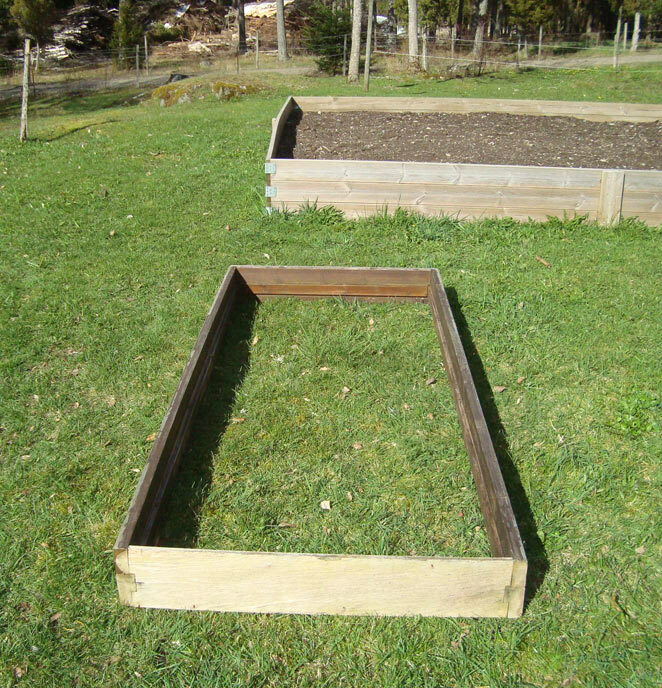 We explained that we planned to use it for a raised strawberry bed. She said this is our junk pile so you can have it for free. She said if there is anything else you can use out of the pile feel free to help yourselves. As luck would have it we forgot to bring any rope. The lady had a giggle when we put the seat down in the car and hooked the door jam on our front seat head rest. We used dog leashes to strap it down and tie the back door shut. The dog leashes are bright orange with reflex strips so we were legal. We found our spot in the garden, when we got home. Hubby cut down under the grass-roots. We rolled the turf up. 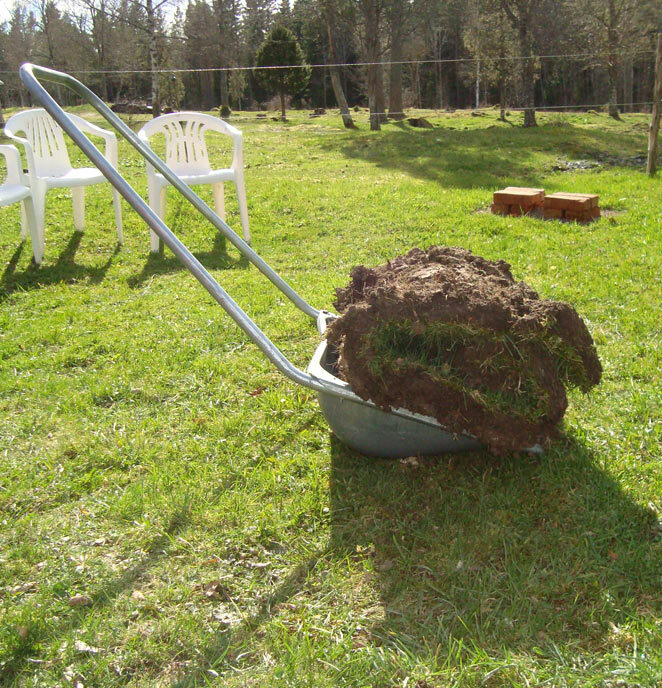 We do this because we re-purpose the sod in a low spot in our garden that rain water makes huge muddy puddles at the entrance to our back garden. We will not have to fight the grass weeds because we removed them in one shot. There is clay dirt under this. 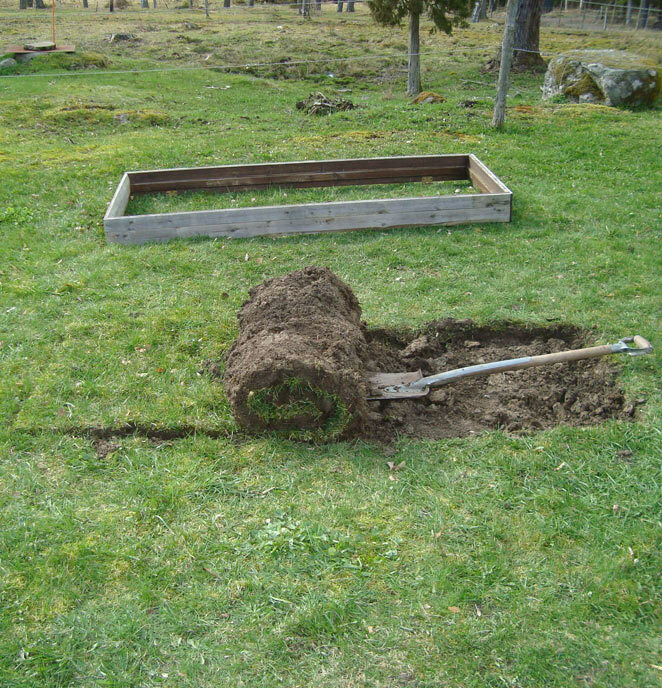 If you place newspapers, straw with out seeds, and then manure, it will decompose and turn the clay into soil. 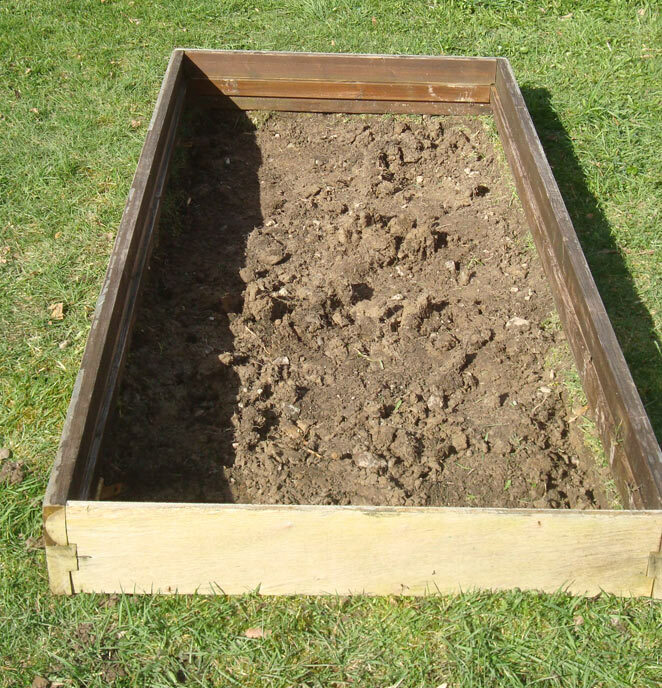 You then top it off with a layer of planting soil. We used our snow shovel to roll it on to because it is so heavy. This makes it easier to pull it to the spot we chose for it. It saves our backs because we don’t have to lift it into a wheel barrel. We use our snow shovel for many uses in the summer time. 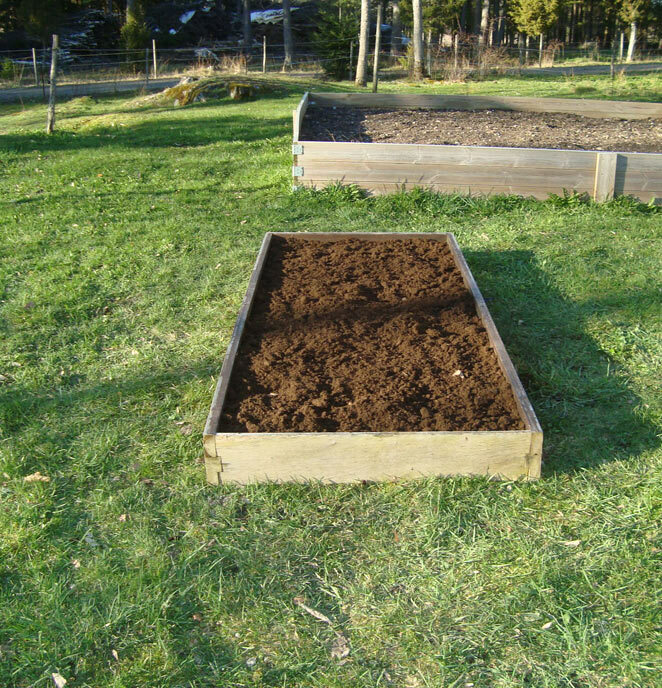 We put 9 x 40 liter bags of soil to top it off. Late in the season last year we bought 12 small strawberry plants. I put them in the green house between the tomato plants. I tended them cutting off their daughter shoots and replanting them late into the winter. This is what we had this year. 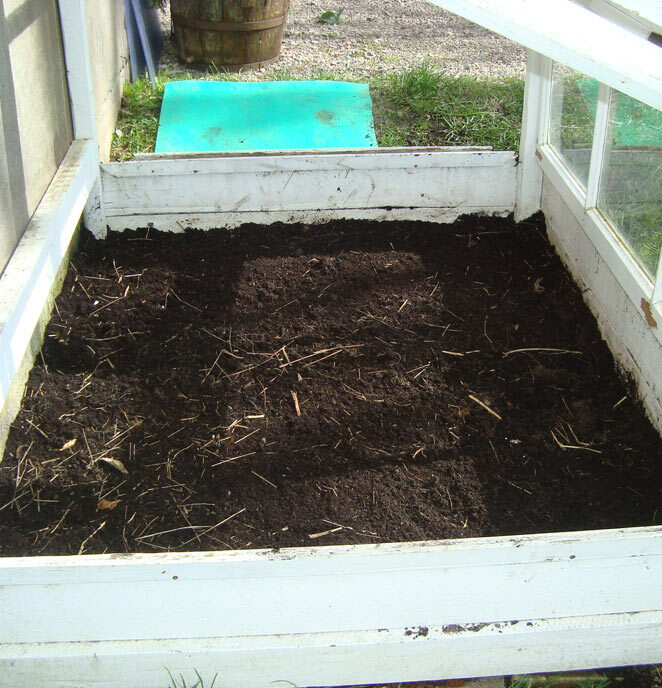 This is what the green house looked like after we transplanted them all. We were surprised how many strawberry plants we had too. The Roots on the original 12 plants were between 6-8 inches deep. We got a surprisingly amount of large strawberries last year from them. I was surprised that we got any at all because they usually take three year old plants to start getting a good harvest from them. 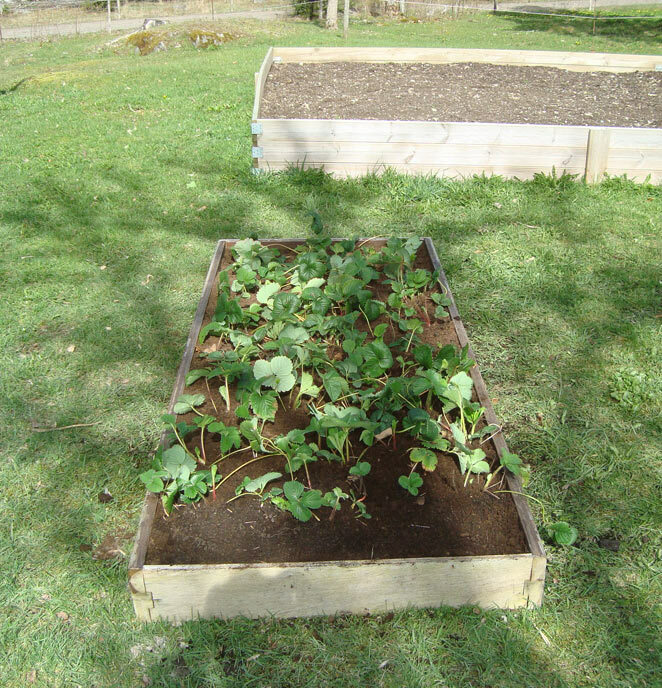 I am so looking forward to see how many strawberries that we get this summer from them. 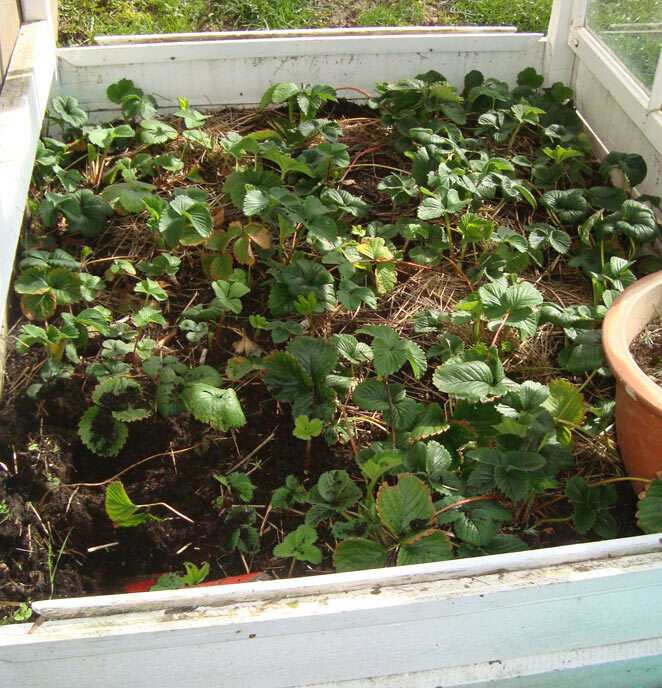 I had originally thought, that we were going to have room for the Rhubarb plant in here as well. Hubby kept telling me that there wasn’t going to be enough room. He was right. We are going to need to go back and get another door jam for another bed later.